Peel and Stick Brushed Stainless Metal Wall Tile from Instant Mosaic installs easily over existing tiles or drywall to give your bathroom, kitchen or feature walls an elegant, affordable facelift. The alternating light and dark checkerboard layout furnishes a modern twist to your room aesthetic, certain to extinguish the drabness of your existing motif. You won’t need any adhesive, caulk or grout to install these 12 in. x 12 in. tiles—just undo the paper backing and adhere to a dry, flat, dust-free surface. Each tile weighs 1 lb. 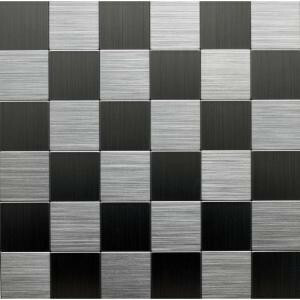 Buy online Instant Mosaic 12 in. x 12 in. Peel and Stick Brushed Stainless Metal Wall Tile EKB-03-104, leave review and share Your friends.